Those who have been awarded a Purple Heart deserve our respect and thanks. The award is presented to individuals who suffered injuries from acts of aggression by enemy forces. In today’s post, we are going to research the Purple Heart. There are cases where some assume they, or someone they know deserves to be awarded a Purple Heart, but the Army has refused. In most cases, the Army is right. There are certain stipulations that a Soldier must have met to attain this award. I personally hope that those of you reading this never are awarded the Purple Heart. If you are, it means you have been either wounded or killed by enemy forces. While the Purple Heart is a prestigious award, I honestly don’t wish that any of our men or women receive it, because it means they have been wounded or killed. 1: It is the oldest military badge. The original Purple Heart was actually called the Badge of Military Merit. It was established in 1782 by the Commander in Chief of the Continental Army. That would be none other than George Washington himself. Sergeant Daniel Bissel: 2nd Connecticut Regiment of the Continental Line. Sergeant Bissel was a Soldier and a spy that greatly helped our nation gain independence. Sergeant William Brown: 5th Connecticut Regiment of the Continental Line. It is believed Sergeant Brown earned this award when he was the Standard Bearer of the Forlone Hope at the Battle of Stony Point. Sergeant Elijah Churchill: 2nd Continental Dragoons of Connecticut. Sergeant Churchill showed many forms of gallantry in action, and upon being wounded in one of the battles he served in, Commander in Chief Washington recognized him with the Badge of Military Merit. are prime reasons for an individual to be awarded a Purple Heart. Friendly fire does count as a reason to receive a Purple Heart. 5: Can it be sold? This has been a huge matter of debate. No, it is not illegal to buy or sell Purple Heart medals. Now if you ask me about the morality…well don’t ask. Don’t try to sell them on eBay though…they won’t allow it. Also, it is illegal to sell or buy a Medal of Honor. 6: Civilians can receive a Purple Heart. Wait now, no they can’t. In 1962, President John F. Kennedy signed an order stating that any civilian serving in a capacity of aiding the United States Military can be awarded the Purple Heart. In 1997, the Military Order of the Purple Heart requested that Congress do away with that order, which they did. A new award was made for civilians which is called the Defense of Freedom Medal. 7: The Purple Heart does not mean you automatically qualify for veteran’s benefits. While many of us believe having a Purple Heart should automatically provide you with all the veteran benefits that are available, it doesn’t. Our best advice is that you contact your local Department of Veteran’s Affairs. You should qualify for benefits, but just like everything else, there are forms that will need to be filled out. No co-pay on hospital or outpatient care. This does not include medication or long term care. Eligible for Sensory Neural Aids. To be eligible for this, you need to visit this website. They will need proof of your Purple Heart, and they will reimburse you for any co-pays you have made since 1999. 9: Purple Heart precedence. The Purple Heart is just above the Defense Meritorious Service Medal, and just below the Bronze Star. 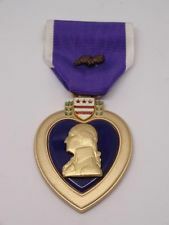 If a Soldier qualifies for more than one Purple Heart, they will receive Oak Leaf Clusters for each added Purple Heart. Again, these are just estimates. The Purple Heart is an award that has been around for a very long time. Do you, or someone you know have a Purple Heart? We would love to hear the story on how it was achieved if you are willing to tell us. If you feel you deserve a Purple Heart, or a friend or family member does, please also tell us the situation. Maybe we can help explain why it wasn’t awarded, or we can lead you down the proper path to request the award that is deserved. To all who have achieved a Purple Heart, Thank You for your gallant service. You have every right to wear that medal with pride.